Harvest Season: July to August.----- Color of fruit at maturity: Greenish-Yellow, red and Pink.----- Size lbs: 1 1/2----- Fruit Production: Consistent, Medium-Heavy bearer.----- Growth rate of tree: Vigorous; Large, compact, upright canopy.----- Height of mature tree: 50 feet.----- Eating quality (as provided by the experts at Fairchild Tropical Gardens, Miami, Florida): Excellent----- Fiber content of fruit: Little----- Miscellaneous: Seedling of Brooks planted in 1932 at the home of Mr. Leith D. Kent of Coconut Grove, Florida. 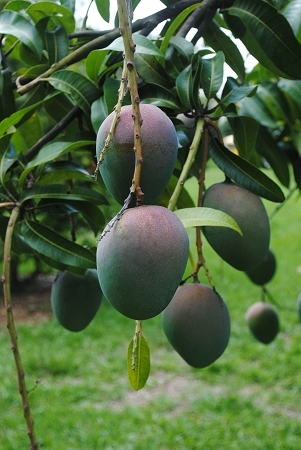 The tree first fruited in 1938 and was named in 1945. 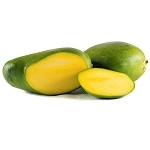 Considered by many as one of the best tasting of all Florida Mango varieties. Still commercially grown. Mango Tree - Tommy Atkins 30 gal.